WPI’s Liquid Waveguide Capillary Cells are made of fused silica tubing with an outer coating of a low refractive index polymer. Your liquid sample is guided through the capillary and represents the core of the waveguide. The hydrophilic character of the fused silica capillary inner wall results in high signal stability and easy removal of air bubbles trapped in the flow cell. However, the transmission of the LWCC is mainly dependent on the intrinsic attenuation of the sample liquid. 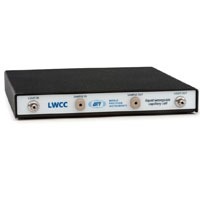 In case of water, a usable wavelength range from 250 nm to 720 nm wavelength can be observed in a 100 cm pathlength LWCC. Using a 500 cm pathlength LWCC will reduce that transmission range from 300 nm to about 700 nm. However, when switching from water to methanol as a solvent, transmission into the NIR are possible with suitable light sources and detectors.